Just four, that’s all that remain. Four original circuits. Four classic tracks that make the heart beat so much faster. Four arenas of speed which reward the bravest and the best, testing man and machine as all race arenas should. Monza, Monaco, Silverstone and Spa. The four theatres of speed which staged grands prix during the first year of the Formula 1 World Championship in 1950 and still do. Sure, major modifications have altered various sections of all these circuits, but, in essence, they all remain true to how it all began. Only now in this era of ultra-modern and often ultra-antiseptic circuits do we really begin to appreciate just how fortunate we are to experience something of a fast disappearing age. Sunday’s event at Spa-Francorchamps and this weekend’s Italian Grand Prix (for me the pinnacle of the F1 season) at the wonderful Autodromo di Monza, coming in a late summer back-to-back week, focus the mind and senses on just how it could and should be. To walk along tree-lined avenues of ages-old Tarmac photographing modern-day thoroughbred F1 cars racing at breakneck speeds, glossy bodywork flickering bright as warm sunlight and dark shadows stretch long across the track, is just about as good as it gets. The flat-out stretch from Lesmo Two to the Ascari Chicane is at once a terrifying and stupefyingly wonderful place to stand. So it begs the question why. 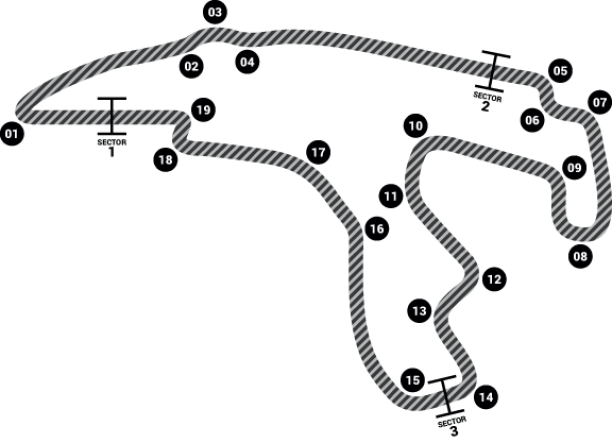 Why do just about all of F1’s ‘new’ circuits so patently miss the mark? I’m not saying every track we race at should be a cobweb-laden throwback to the past, but it just seems such a shame that when the current circuit designers design, they (appear) to do so with all the wrong priorities. Safety is paramount - that’s a given - but after that it should all be about spectacle. Not in the way the characterless concrete behemoth of the monstrosity that is Shanghai’s circuit provides. Unique in provoking feelings of awe and despair in equal measure. Not in the way Bahrain’s desert track resembles a bland 1980s computer game. I’m afraid the addition of a few palm trees and two ponds containing aquamarine-coloured water doesn’t cut it either! Recently built race tracks rarely seem to capture more than a smidgeon of their older cousins’ qualities and yes, while I know it’s difficult, what with land prices, economies of scale, television demands (look how that destroyed Hockenheim) etc, etc, surely someone in the offices of those responsible can see what’s gone wrong. When one buys a fake Rolex watch one knows that it’s not the real thing, but to all but the most questioning eye it looks ostensibly the same. Tells the time and looks good(ish!) on the wrist. So why not apply this philosophy to building new race tracks? It can’t be that hard, can it? Maybe things will change, maybe they won’t, and the four originals we have will get ever more special, joined in the pantheon of greats by Suzuka and Sao Paulo. All who love this sport of ours must hope someone with a drawing board rises to the challenge sometime soon. Please now take a few minutes to enjoy my pictures from the 2012 Belgian Grand Prix by clicking here.